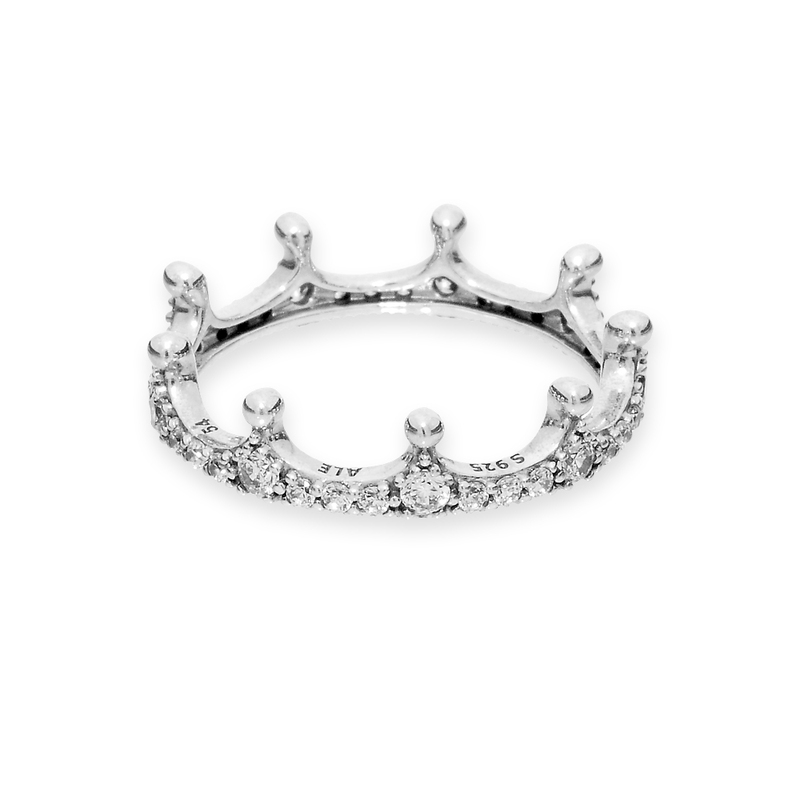 Make any outfit majestic with this crown-inspired ring in sterling silver, embellished with glittering stones. Wear it solo or stack it with crowns in other metals to give it the ultimate royal treatment. Available online and in-store from size 44 to 64. Enchanted Crown Ring is rated 2.8 out of 5 by 57. Rated 1 out of 5 by Kim2012 from Bad quality When I received this ring, it was missing two diamonds. I took it to my local PANDORA store, and the ones that were on display were missing diamonds roo! I ended up exchanging the ring for a PANDORA signature necklace. Rated 2 out of 5 by Juwalker91 from Beautiful.. but poor quality I bought my ring at Disneyland and I love it so much! I loved having a keepsake from my trip that i could wear everyday. After about a month I am missing 6 stones. It is beginning to look like stones are supposed to be missing because so many of them are ! I love this and would repurchase if they remade it and guaranteed better quality. I feel like i wasted my money on this, i spent that much thinking it would hold up. I should have just bought some costume jewelry at a Disneyland boutique. Rated 1 out of 5 by Missmarino from Stones fall out It's super pretty and shiny under the sun, but the stones fall out left and right. 2 weeks after I got it, it started to fall out and not only that but the ring started to bend. The ring at the end was missing 7 stones and was an oval shape. I work a desk job and I only wore it at work, I take it off to wash my hands. This shouldn't be happening, I am disappointed because I really like the ring. Rated 3 out of 5 by brooklynhume from diamonds keep falling out i love the look of the ring. but the diamonds are constantly falling out. the first ring i got, one big diamond fell out within the first three days of owning it. i went to pandora to get a new one, the next day 3 diamonds fell out. this is my first purchase with pandora. i’ll have to say i’m a little disappointed keeping in mind the price i payed for this ring. Rated 1 out of 5 by noangel310 from Ring came missing stones we returned it. Wish we would have listened to the reviews on this site, this ring is poor quality and arrived missing stones. We returned it for a different ring as soon as we got it. Rated 2 out of 5 by Heidi S from Didn't last I have had this ring less than a month and 2 stones have already fallen out. Rated 5 out of 5 by britt0505 from I love my ring! Just got it and I love it! Fits greats and I love the shape and size!